Description: A pair of repainted Grinsteins leads this train toward Kansas City and points east. Description: Here are the DPU's on the Miller coal drag. Description: Coal train waits for a crew outside Livingston. Description: Coal train rolls along the Gallatin River. 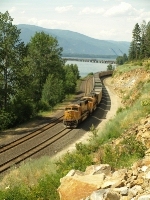 Description: Coal train rolls through Kelly Canyon a few miles East of Bozeman. Title: Got the whole train! Description: Curving over the longbridge, which is undergoing rebuilding at it's south end, hence the blue cranes. Description: 2 SD70MACs make it look easy a unit train of DEEX coal gons. Description: BNSF 5983 leads this empty SLC coal train north on the BNSF Hannibal Sub. as it nears the small town of Foley, Mo. Description: K SHWSHW helper set. Title: BNSF 8800 Class leader. Title: BNSF 8800 Class leader heads up a SB coal load. Description: Trailing on an outbound mixed freight sitting in Springfield Yard.